Approaching Week 30 of my pregnancy.. I'm debating if this entry should be under the "pregnancy" category but I digress.. This feels more like a life update than being pregnant-specific. BUT! They're very closely related.. We'll see. I am actually looking forward to re-do the smallest room in our apartment and turn it into the baby's room. Currently it's more like a storage/cram whatever/guest room. It's a weird sort of room, very dusty as we don't go into it that often but I am really excited about moving things around in between the smallest room and the second room. So far we haven't really bought much baby stuff apart from a carseat, foldable baby tub and a playpen because we haven't got a place to put them in yet. We decided to go with a portable playpen instead of a traditional baby cot since we're due to move out some time next year and the one that we bought seemed easy to pack up in between rooms or houses. There is a single bed in the small room which I think will remain there for late night feeding or to catch some sleep. That room has almost no natural light coming in which is perfect for sleeping at any time of the day. Monkey had mentioned that he wanted to get a kiddy-curtain for that particular room. I find that amusing since that never really crossed my mind. We also need to switch up the curtains in our room. It's been the same white curtains since we moved in a year ago because I like having a diffused light coming into our room, plus it makes the room a little more spacious than it really is. But hubs is REALLY concerned about getting enough sleep, so we'll be looking into thick, dark curtains soon. As much as I hate having everything from IKEA, it's just SO easy to get things that I need under one roof! Seems like they have expanded their range in the baby-category in recent years and I do think we'll be buying some baby related things there.. of all places! 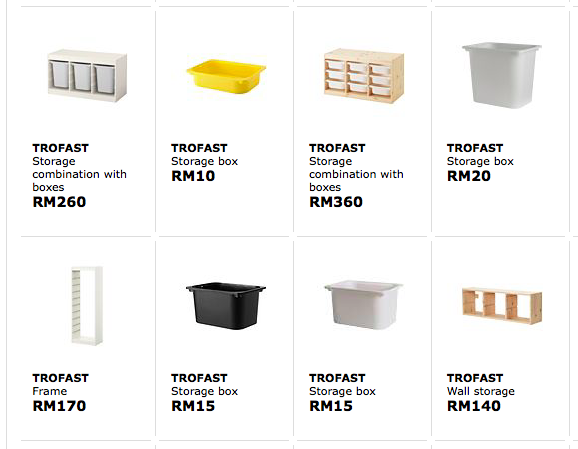 I do have my heart set on the Trofast storage system. I had mentioned to Monkey about getting the boxes with lids in several sizes for different things. Smaller ones for the teeny tiny clothes while the larger ones to store other things. Then maybe after the move to a more permanent place, we'll get the frames that the boxes will fit into. I'm actually really excited about that. Excited about organising baby things and see what we have enough of, or what more do we need. Well, we need a heck lot more! Hubs and I haven't really got into that shopping mood just yet although we have bought some random bits and bobs.. a couple or two clothes from the sale in Mothercare that is currently ongoing 'til second of July. I still have my heart set on picking up some Aden & Anais swaddle and blankets because I keep hearing so much about them, so I'll be waiting for that baby expo coming up at the end of July. Hopefully I won't be too huge and tired to walk around by then! We really do have a LOT to do around the house and I just pray that Monkey won't end up having to do everything by himself. I've been told to start making a list of things that I'll need but I just can't seem to get around to it! Seems so REAL and SO MUCH MONEY! hahahaha! Do you have any clue how much a good breast pump would cost?! And diapers too! Suppose I'll make the list before the expo in July so we could get a good discount on things that we really need. So far the house doesn't feel any different. While the second room is still occupied, there really isn't much that can be done. Except maybe sort our wardrobes to make room for.. whatever really. I'm starting to get that feeling to nest, but it's frustrating to not have the room for my ideas. Hopefully the lil' kid isn't planning on a surprise and arrive too early. I mean, everyone has warned me that the first pregnancy usually gets delivered ahead of the due date.. I am wrapping my head around that. But not too early please, Nugget! I hate the thought of us running around the house like a headless chicken, trying to get things as organised and settled as I had hoped it would before the baby arrives. I mean, we're planning to move the wardrobe and bookshelf from the smallest room into the second room, so Monkey better not have to do all that by himself! Aaanyway, Eid is coming up and all we could think about is channelling what we have towards the baby's arrival. It's hard to swallow, but for the first time in my life I won't be getting a new outfit for Eid this year! Well, it really is no big deal. But I am a lil' wee bit sad, still. Happy that I'll be spending the holidays with family! Even Monkey will be around for a couple of days! yayy! I'm already imagining all the good food.. SO excited!